Playing For Keeps is an apt title for the latest cd from singer/songwriter Deidre McCalla. From the moment Deidre takes the stage, her engaging presence and irresistible blend of folk, country, rock, and pop seize the listeners by the heart and won't let go. Deidre McCalla came of age in the fiery blaze of NYC's folk heyday - a time when Greenwich Village clubs were filled with the likes of Dylan, Baez, and Ochs; a time when Motown ruled the top of the charts and the streets of America screamed with anger and civil unrest. Her first album, Fur Coats and Blue Jeans, was released when Deidre was 19 and a student at Vassar College. With a theater degree tucked under her belt and an acoustic guitar tossed in the back of a battered Buick station wagon, Deidre McCalla hit the proverbial road and never looked back. Deidre later majored in jazz guitar at the Wisconsin Conservatory of Music and released three albums with the pioneering women's music label Olivia Records. The Miami Herald affectionately dubs her a "dreadlocked troubadour." 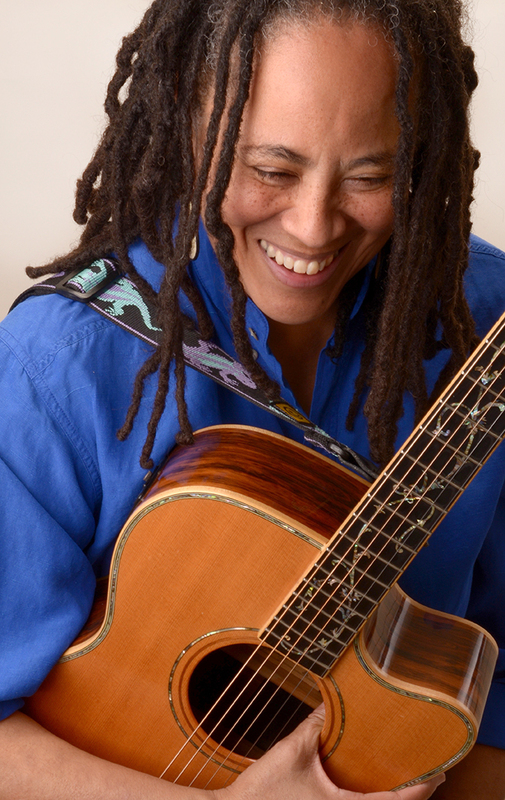 From Maui to Maine, college coffeehouses to Carnegie Hall, Deidre McCalla is a much beloved performer in both folk and women's music circles and has shared the stage with a long list of notables that includes Suzanne Vega, Tracy Chapman, Holly Near, Odetta, Cris Williamson, and Sweet Honey in the Rock. With five critically acclaimed albums to her credit, Deidre McCalla remains the ever seeking road warrior, her words and music chronicling our strengths and weaknesses and celebrating the power and diversity of the human spirit. A single parent residing in Georgia with her son, Deidre has taught Performance at Warren Wilson College's Swannanoa Gathering. Deidre's work has been published in Home Girls: A Black Feminist Anthology, The Original Coming Out Stories, and Chrysalis: A Feminist Quarterly, and she is featured in The Power of Words: A Transformative Language Arts Reader. Deidre is a proud member of AFM Local 1000 and the North American Folk Alliance.